The common thread tying all the residents of Brahman Tola with a single disease – fluorosis – is their drinking water. “The groundwater of Brahman Tola and its neighboring villages in Ghadbad and Birsinghpur panchayats of Baliapur block is laced with high fluoride. Groundwater is the primary source of drinking water for these villages, which depend on hand pump and dug well to meet their daily water needs,” Eklavya Prasad, managing trustee of Megh Pyne Abhiyan or MPA, a non-profit working on water and sanitation issues, told VillageSquare.in. “The pain started from my right leg and slowly moved upward in my back. Then, my entire body was affected. Getting up from the bed and moving around has become a challenge,” said Chakrabarty, who has consulted doctors at Dhanbad and Asansol in West Bengal, all of whom have diagnosed him with fluorosis and prescribed painkillers. “Doctors claim that I got this disease from drinking water. So, I have only two choices – die without water, or die drinking poisonous water,” said an exasperated Chakrabarty. Fluoride is a micronutrient and is widely distributed in the earth’s crust, mainly as the minerals fluorspar, fluorapatite and cryolite. According to the World Health Organization, fluoride intake has both beneficial effects in reducing the incidence of dental caries, and negative effects in causing tooth enamel and skeletal fluorosis following prolonged exposure to high concentrations. The dental effects of fluorosis develop much earlier than the skeletal effects in people exposed to large amounts of fluoride, says WHO. Clinical dental fluorosis is characterized by staining and pitting of the teeth. In more severe cases, all the enamel may be damaged. The WHO has set the fluoride guideline value of 1.5 milligram per liter for drinking water, beyond which fluoride starts to show adverse human health effects. In India, the BIS drinking water standard for fluoride is divided into two parts – an acceptable limit of 1 mg/l, and a permissible limit of 1.5 mg/l in an absence of an alternate source. But, the groundwater and drinking water supply in several regions of the country contains high fluoride levels. The Union Ministry of Health and Family Welfare has recently identified at least 132 districts in 19 states severely affected by high fluoride content in drinking water, a leading cause of fluorosis. “The terms like acceptable and permissible limits do not make sense. It should be toxicity limit and down to 0.5 mg/l because, even at that level, fluoride can affect human health,” Sunderrajan Krishnan, director of Anand-based INREM Foundation, a research institution working on water, public health and agriculture, told VillageSquare.in. Krishnan has done extensive field-based research on impacts of fluoride on human health. According to the residents of Brahman Tola, a couple of years ago, the Public Health Engineering Department or PHED tested water quality of hand pumps in their village. Last December, MPA carried out a survey of high-fluoride affected villages in Ghadbad, Birsinghpur and Machiyara panchayats of Baliapur administrative block in Dhanbad district. Water sources of Brahman Tola were tested as well. Children were screened for dental fluorosis at local schools. “Using field-kits, we tested water quality of 11 villages and hamlets in the three panchayats. A total of 45 dug well samples and 78 hand pump samples were tested. Of these, only six samples of dug wells and three samples of hand pumps were found safe for drinking. The rest had fluoride levels above the permissible limit,” said Pradeep Poddar, program officer at MPA. “I used to have clean, white teeth. But, for the last three-four years, my teeth have developed brown stains. Elders tell me that it is due to the water I drink. My friends also have stained teeth,” said Debu Sarkhel, a nine-year-old who studies in the 6th standard of the local middle school. While fluorosis has become a public health issue in the affected villages, private companies selling bottled water are making private gains. Almost daily, vans supplying bottled water visit the affected villages. “I cannot bear to see my husband suffer every minute. So, I buy 20-liter bottled water for Rs 20. Both my husband and my son drink that water. I continue to drink the hand pump water,” said Bani, wife of Chakrabarty. The condition of 60-year-old Gita Chatterjee, a widow, is worse. She lives alone and can barely walk a few steps. “I have to beg and request village youth to fetch me some drinking water,” said a hapless Gita. According to Thakur, only 10-12 families in Brahman Tola have the money to buy 20-litre jar of drinking water. 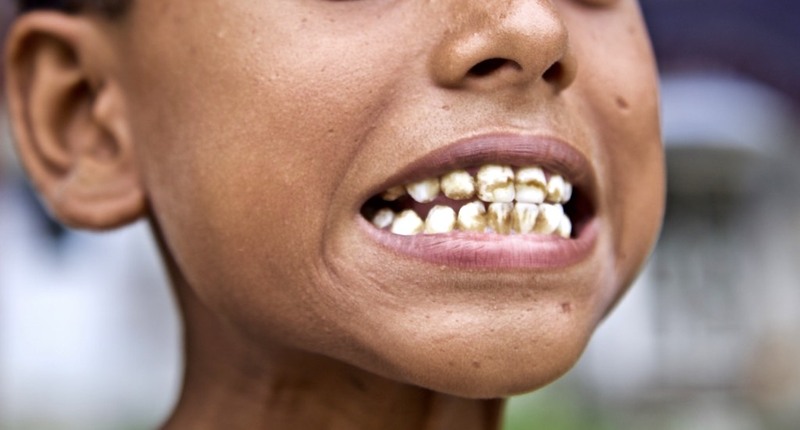 “Fluorosis has crippled us and we cannot earn a living. Buying bottled water is an additional cost,” he lamented. The state government and the district administration are aware of the sufferings of people in the fluoride-affected panchayats. Three years ago, Rs 7 million worth of drinking water treatment and supply scheme for the affected villages, including Brahman Tola, received technical sanction from the state government. As per the scheme, water of Damodar River is to be treated and supplied to the villages through piped water supply. Villagers have to pay a user fee to the village water sanitation committee. But, the scheme hasn’t made much progress. “The work is already underway. It was expected to be completed by November, but there has been some delay. The scheme should be functional by March next year,” said Kuldeep Chaudhary, deputy development commissioner of Dhanbad. According to him, the Dhanbad Mineral Fund Trust, which is based on royalty received from mining companies in the district, is highest in the country, somewhere between Rs 50-60 million. “Sanitation, water and environment are the priority areas where we want to spend the trust fund. We can use money from this fund to support the villagers suffering from fluorosis,” added Chaudhary. The people of Brahman Tola and the surrounding villages have suffered enough in the past few decades. An entire young generation is at the risk of being crippled for life. The government must act on a war footing and supply safe drinking water to the people.